The relationship of skin reactivity and serum immunoglobulin E (IgE) levels to the prevalence of chronic respiratory symptoms and to ventilatory capacity is examined in workers exposed to different organic aerosols. The results from group of control workers similarly tested are also presented. Workers exposed to occupational allergens had positive skin tests more frequently than did controls, except for soy bean workers. Workers with positive skin tests to occupational allergens had a higher prevalence of almost all symptoms than those with negative skin tests although the differences did not always reach statistical significance. Workers with positive skin reactions in general had significantly higher serum IgE levels than did workers with negative skin reactions. 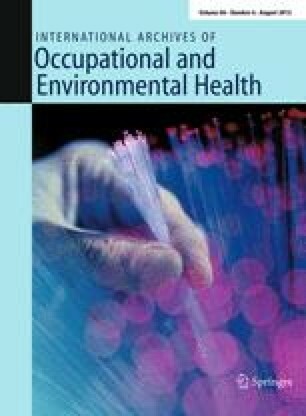 There were across-shift reductions of ventilatory capacity in all groups of exposed workers, varying for forced vital capacity from 1.7% to 13.3%, for forced expiratory volume from 0.4%–21.9%, for maximum flow rates at 50% from 1.5% to 16.1% and for maximum flow rates at the last 25% of control vital capacity from 0% to 24.9%. There was, however, no correlation between acute and chronic lung function changes and skin reactivity or IgE values. Our data suggest that although exposure to organic aerosols may be associated with frequent immunologic reactions, these findings do not predict objective respiratory impairment.